Win Free Prize In Our "Poetic Expression" Contests! CONTEST IS OFFICIALLY OVER. POEMS ARE BEING REVIEWED TO DETERMINE WINNER. PLEASE FEEL FREE TO READ THE WONDERFUL ENTRIES BELOW. THANKS! Express your creative side as part of our contest, or browse our entries for some good reading. It’s Free! Either way you have nothing to lose! I have been receiving several positive emails with suggestions on how we could improve this site. One such suggestion was hosting contests for our visitors. When I thought about, it made a lot of sense. We have been receiving a lot of return visitors here at Signs-of-a-Cheater.com and a good way to say thank you is by giving back to those that help make this a better site and forum to share and express our views and problems in search of a happier life! I have begun actively searching for future sponsors. If we can bring one on board for this contest then even better! SPONSORS! Let's here from YOU! It's simple! Just fill out the form below sharing your own Poem about anything to do with cheating, infidelity, adultery, affairs or anything related. You can enter as many times as you like by submitting a poem. 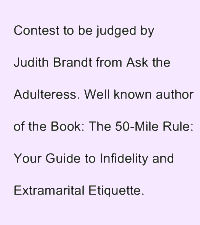 The winner will be chosen by Judith Brandt(Author of: The 50-Mile Rule: Your Guide to Infidelity and Extramarital Etiquette). Glad to have her onboard! The contest will run up until March 17th to give you time for this first contest. Be sure to tell your friends, family or anyone that you think has that creative side to them! It may be an easy $50 for them, or you! If you copy and paste something from somewhere else on the web, your entry is not valid (yes, I'll be checking!). The “Poetic Expression” contest is about unique and creative expression. The poem doesn't have to be unique to you, but it does have to be in your own words. The more creative the better! Nothing that can be considered "adult only" or "vulgar" will be posted. This is not that kind of site. :) But heartfelt words are more than welcomed! Very Important! If you'd like to be in the running for a prize, you need to be sure that you don't forget to check the box for email notification (on the next page) after you've submitted your entry, so I'll know how to reach you with the good news if you're a winner. If I can't contact the winners by March 24, I will choose from the runners up. ...right NOW! So go ahead and give us your best "Poetic Expression" before someone else beats you to it! "Let Your Poem Shine With Your Words!" Share your Poem about Cheating or Infidelity for the world to read and possibly win $50! - -- Nothing to Lose! He stole money Not home plate Now he's locked up Behind the gate. Follow the whispers from deep within your heart and track his cell phone calls.